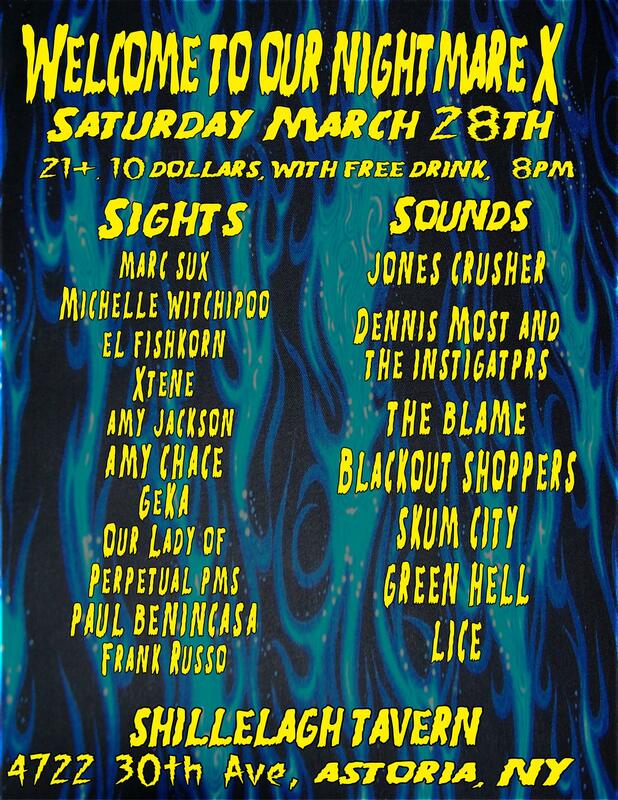 Yet another reminder of Welcome To My Nightmare X, coming up next Saturday, March 28th. Welcome To My Nightmare X flyer. I will be showing and selling my work, along with other artist and bands. Smarter than the average bear. Here’s my rendition of Yogi Bear on Sketch Lottery. Yogi Bear # 9 on Sketch Lottery, drawn by Michele Witchipoo. March 2015. Finally released a new Psycho Bunny mini-issue after a long hiatus. Actually thinking of retiring the character to begin anew, but apparently people started to ask about him. So on March 7th, I debuted a new Psycho Bunny mini-issue, the first since 2011. That same weekend of March 7th, I had also self-published and released a mini-issue of various sketches done over time. Latest from WitchesBrewPress, aka, Michele Witchipoo. March 2015. While the mini-sketchbook ‘PinUps‘ is now on sale at my Etsy store, there’s only very few copies of the Psycho Bunny mini-issue. So I doubt I would slap that one on my Etsy store. So when that Psycho Bunny mini-issue is gone, it’s gone. That’s my plan for the time being. 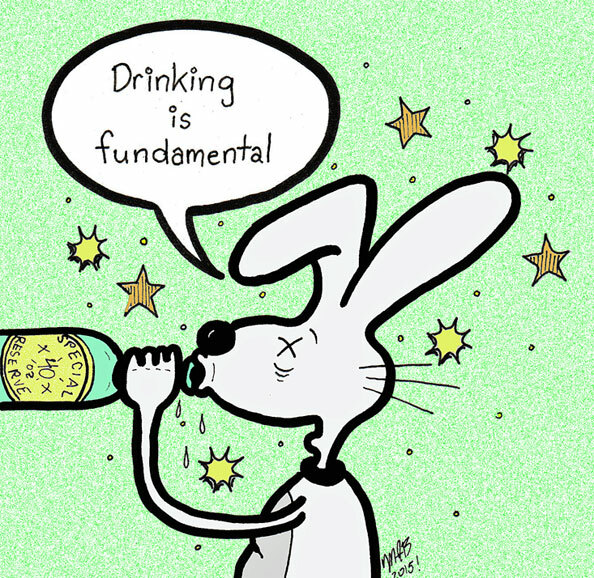 BTW, contrary to what Psycho Bunny is, in real life I’m not much of a drinker. Psycho Bunny stemmed from various people I knew over the years. Also, he’s not the nicest rabbit in the world. In fact, he’s kind of a jerk. Yet somehow underneath it all he actually some kind of a good heart…when he’s not too busy being a misanthropic drunk. 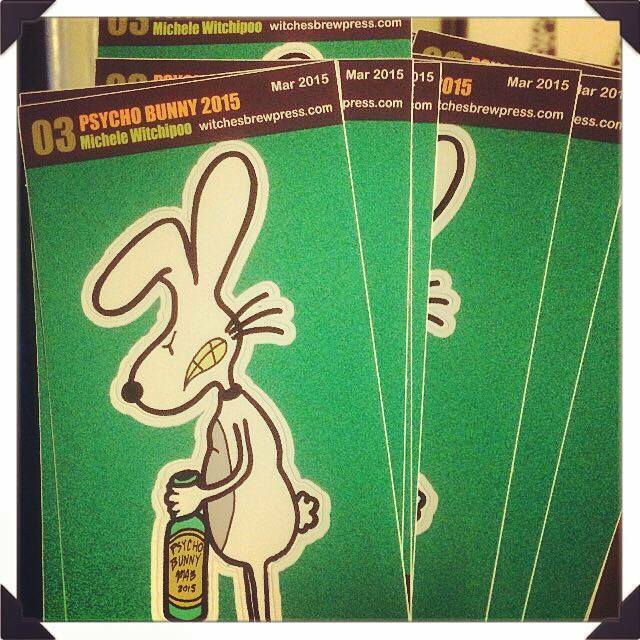 In the meantime, the Psycho Bunny sticker, created for the TIGorg Sticker Club is now officially available. 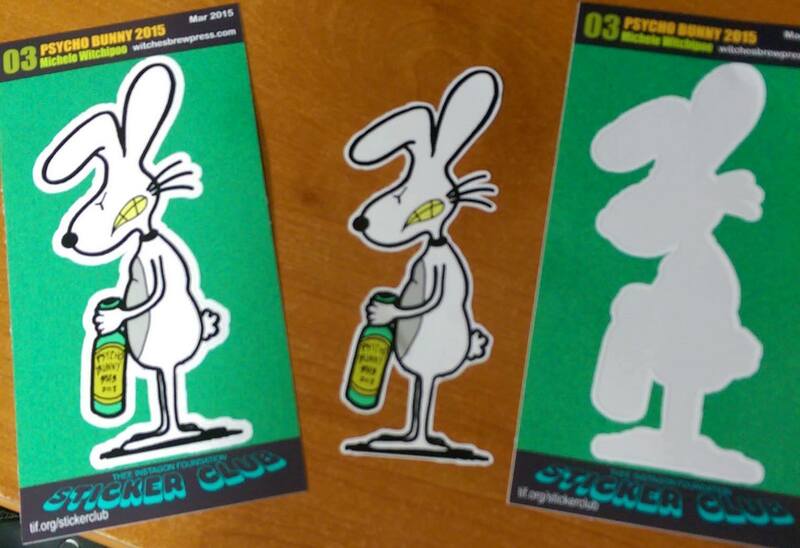 Psycho Bunny is the sticker of the month for this club, and it looks pretty sweet. As a member of this sticker club, you will receive an art sticker once a month. 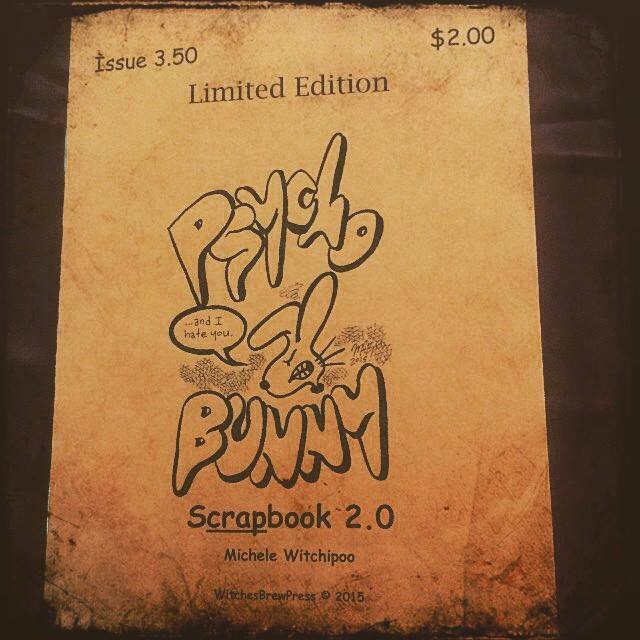 Psycho Bunny was created by Michele Witchipoo. I’ll end this post with some new Psycho Bunny artwork. Cheers. 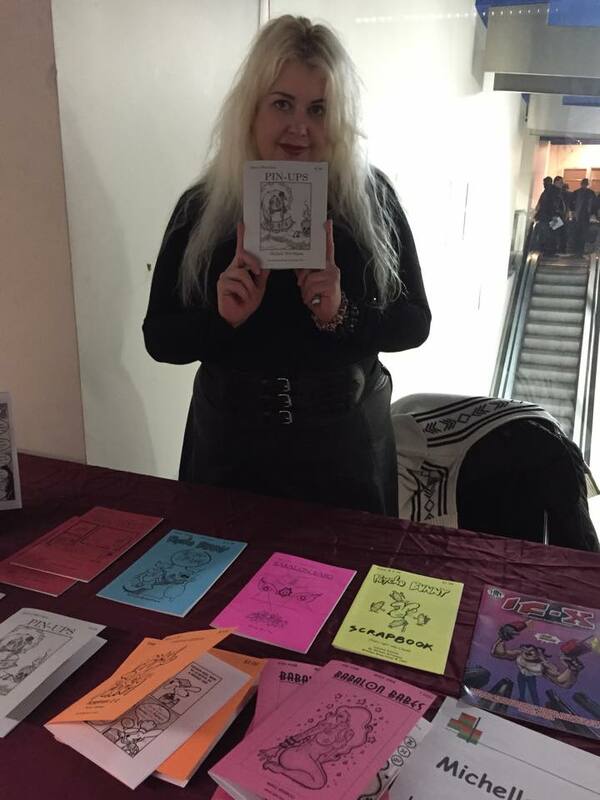 ‘Drinking Is Fundamental.’ Michele Witchipoo’s self published comicbook character. March 2015. Onto another plug. I’ll be showing my artwork and selling my comics at the annual Welcome To My Nightmare show. Welcome To My Nightmare X to be exact. This is also your chance of getting my latest mini-issues, which debuted at the Big Apple Comic Con. It will also be like the third or fourth time I’ll be showing my work in Astoria, Queens. The part of Queens where I grew up in. Ironically, the part of Queens I couldn’t wait to move out of when I was younger. From an early age I was the class misfit, first trying to dress like Boy George. Luckily when it came time for my Siouxsie phase, I was attending High School of Art & Design. Now Astoria is one of these uber-gentrified places in NYC. Go figure. Anyway, if you’re local, you’ll want to be at this event. Last year had a great turnout, and this year proves to do the same. See you there. This past Saturday proved to be quite busy as predicted, but it was a good busy. This was despite foul-ups at the copy place and me fighting some kind of last minute sickness. Overcoming the lack of sleep, both the Big Apple Comic Con and the MF Gallery shows were successful. 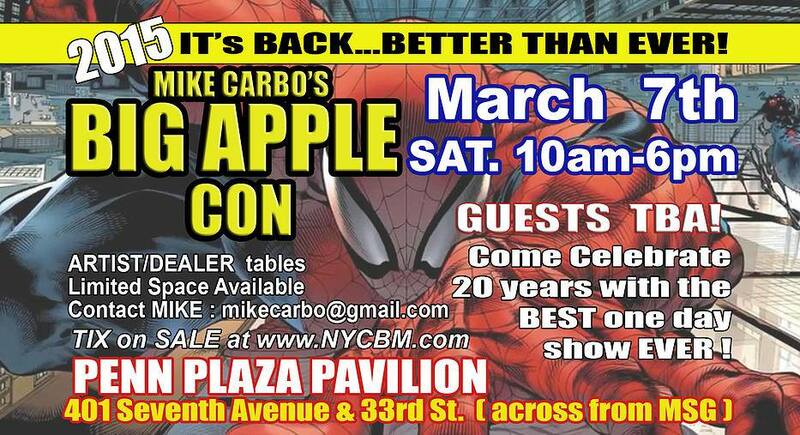 Flyer for Big Apple Comic Con slated for March 2015. It had been a while since I had a table at Big Apple Comic Con. It was the tenth year anniversary of this local comic con. In 2009, Big Apple was acquired by Wizard Entertainment. 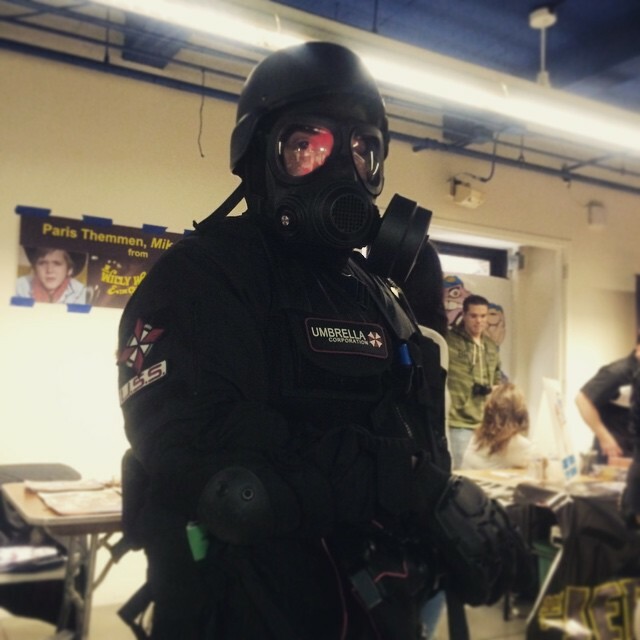 Recently this con went back into the hands of the original organizers. Hey, not to bad mouth anyone but personally I’m kinda glad Big Apple broke away from Wizard World. So it everyone’s surprise, the Penn Plaza Pavilion, where Big Apple was being held was jammed packed solid. It seemed as if almost all the comicbook fans and cosplayers came out in full force. At one point, there was barely any room to walk in the pavilion. In fact, there was actually a line outside to enter the building. 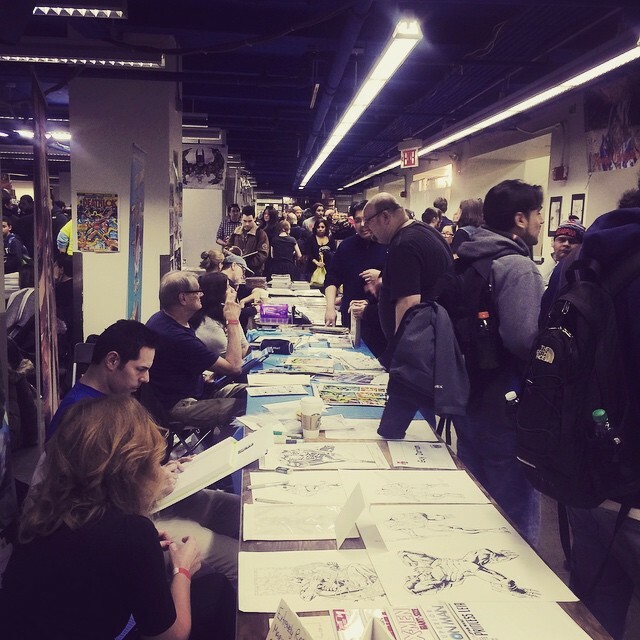 Crowd at Big Apple Comic Con, Sat. March 3rd, 2015. Photo by Michele Witchipoo. Crowd inside Big Apple Comic Con. Sat. March 3rd, 2015. Photo by Michele Witchipoo. 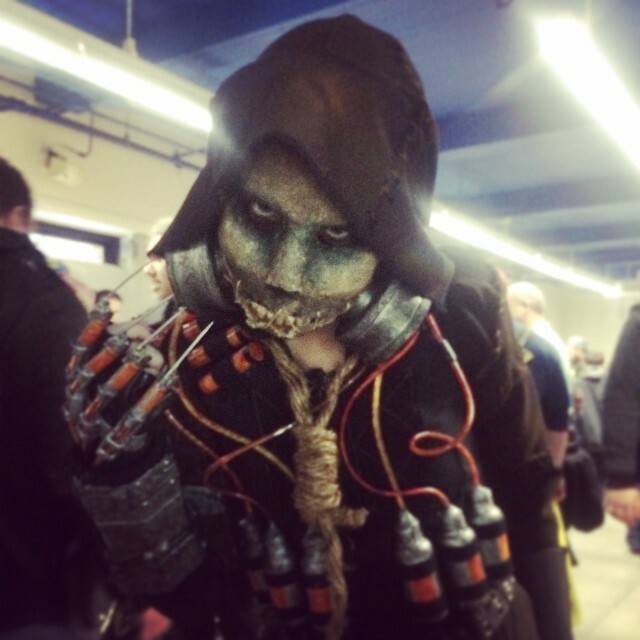 At Big Apple Comic Con, some cosplayers really had some impressive costumes. Cosplayer at Big Apple Comic Con, Sat. March 3rd, 2015. Photo by Michele Witchipoo. Cosplayer at Big Apple Comic Con. Sat. March 3rd, 2015. Photo by Michele Witchipoo. 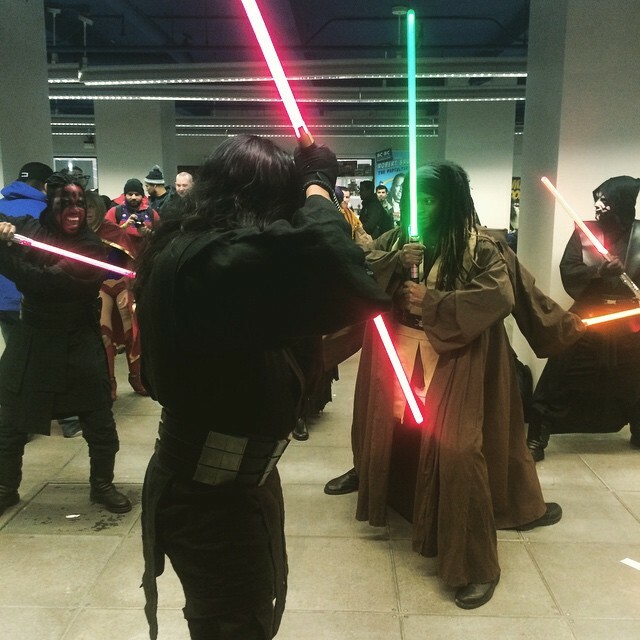 Jedi brigade at Big Apple Comic Con Sat. March 3rd, 2015. Photo by Michele Witchipoo. There were both established and indie/small press comic creators at Big Apple. 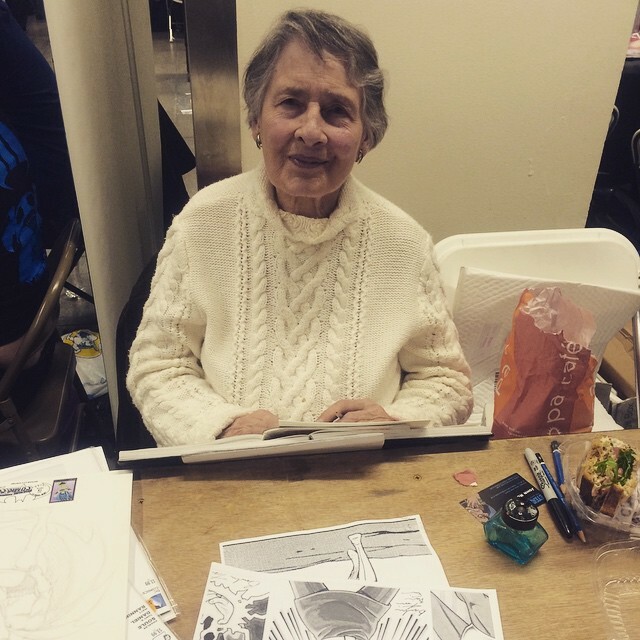 One of the highlights was Ramona Fradon, best known for drawing the Brenda Starr newspaper strip. Ramona Fradon also did the art for various other companies, including DC Comics, working on characters such as Aquaman. Ramona Fradon. A long career in cartooning and comics. Best known for Brenda Starr and Aquaman. Photo by Michele Witchipoo. Sat. 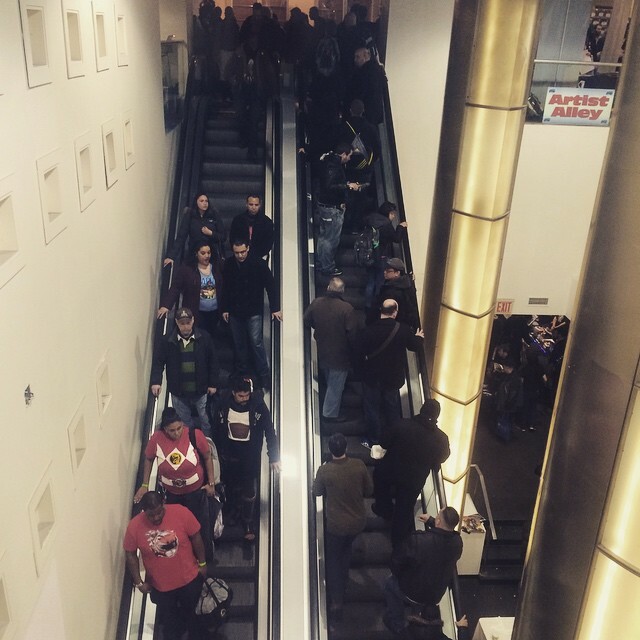 March 3rd, 2015 at Big Apple Comic Con. 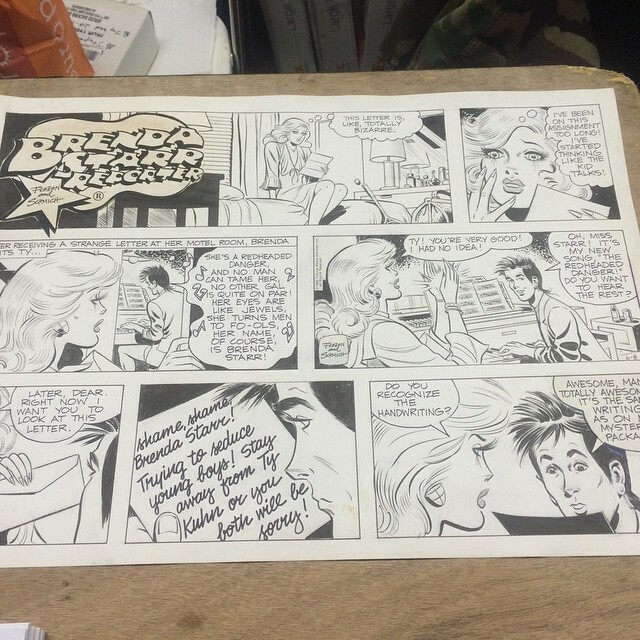 Original art for the newspaper strip Brenda Starr, illustrated by legendary cartoonist Ramona Fradon. 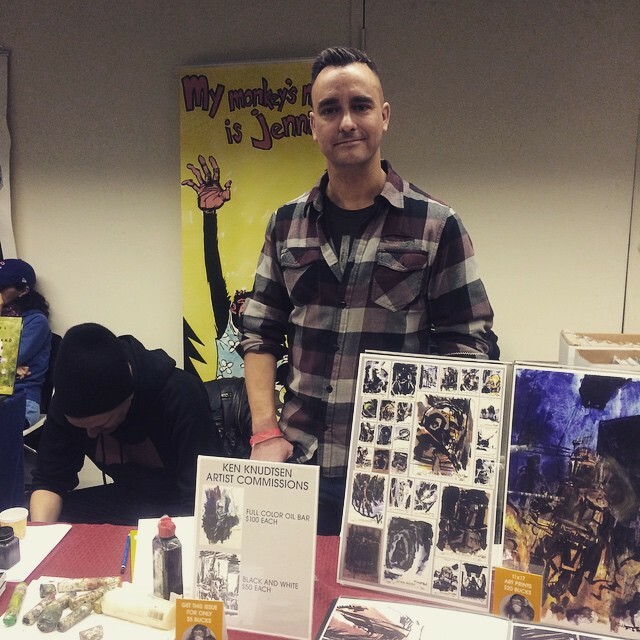 Comic book artist Ken Knudtsen at Big Apple Comic Con. Sat. March 3rd, 2015. Photo by Michele Witchipoo. Of course, I had my own self-published comics to sell. 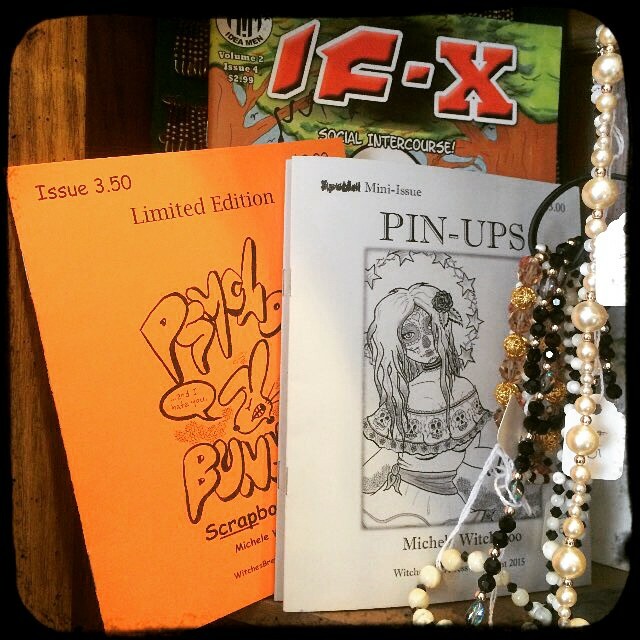 For the occasion, I had two new mini-issues available. One was a sketch simply titled ‘Pin-Ups.’ The other was a limited edition Psycho Bunny mini-issue, #3.50. The Pin-Up mini-issue will be available in my Etsy store soon. Mini-issue from WitchedBrewPress from Michele Witchipoo. Pin-ups. Debuted at Big Apple Comic Con Sat. March 3rd, 2015. 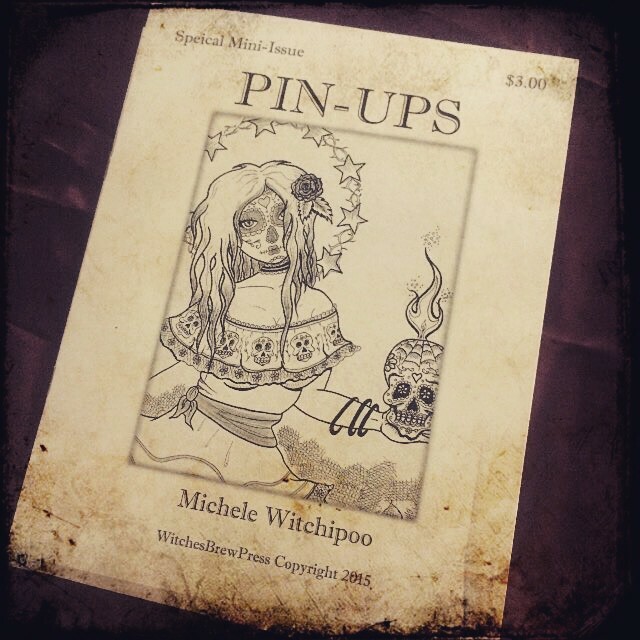 Mini-issue from WitchedBrewPress from Michele Witchipoo. Psycho Bunny Limited Edition #3.50. Debuted at Big Apple Comic Con Sat. March 3rd, 2015. My friend Louisa, art model extraordinaire, was kind enough to take photos of me at my table. Michele Witchipoo at the Big Apple Comic Con, Sat. March 7th, 2015. Photo by Louisa Ashleigh Krupp. Big Apple is also known for celebrity appearances. Wrestler Roddy Piper was there, along with two of the Power Rangers. (Red and Green if you must know) This time I met Johnny Brennan, one half of the prank call team The Jerky Boys. Back in the early to mid ’90s, I quoted The Jerky Boys constantly. My friend gave me a cassette of their first release, which is a comedy classic. Nowadays Johnny Brennan does the voice of Mort from the animated television show Family Guy. I approached the table to tell Brennan what a fan I was. To my surprise, he gave me a free autograph. Brennan turned out to be a sincerely nice man. 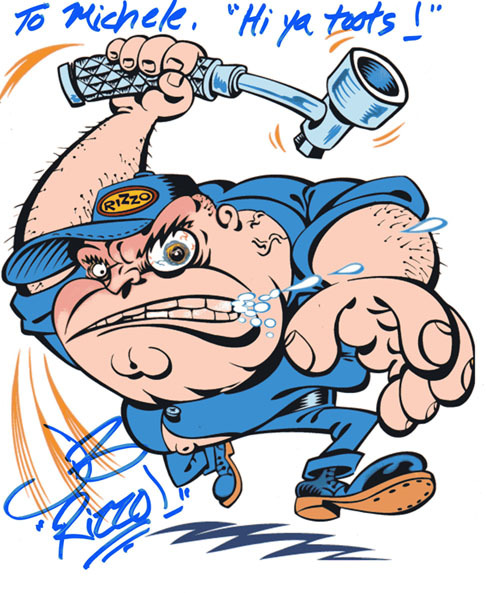 Autograph of Johnny Brennan, of The Jerky Boys and voice actor of Mort from Family Guy. Signed Sat. March 7th, 2015. 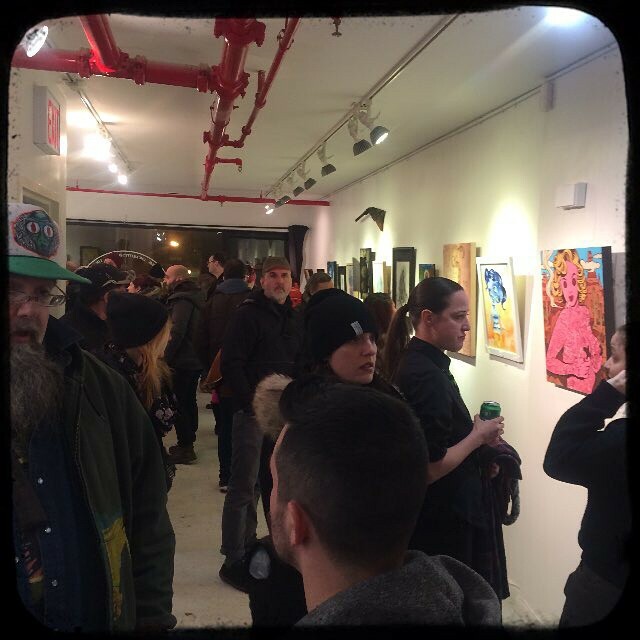 After Big Apple Comic Con, it was off to Brooklyn for MF Gallery. I was honored to be a part of this show, which was held in honor of Women’s Day. 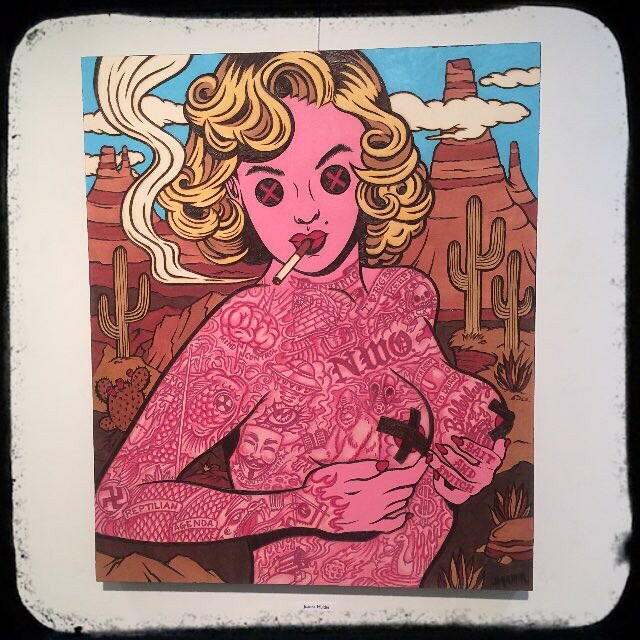 The exhibit was titled ‘GIRLS of The Underground.’ The opening party showcased all the amazing work by a variety of artists. Flyer for Girls of The Underground at MF Gallery. March 7th, 2015. The illustration I submitted was originally drawn for Valentine’s Day. Black and white pen illustration titled ‘Valentine 2015.’ Drawn by Michele Witchipoo. 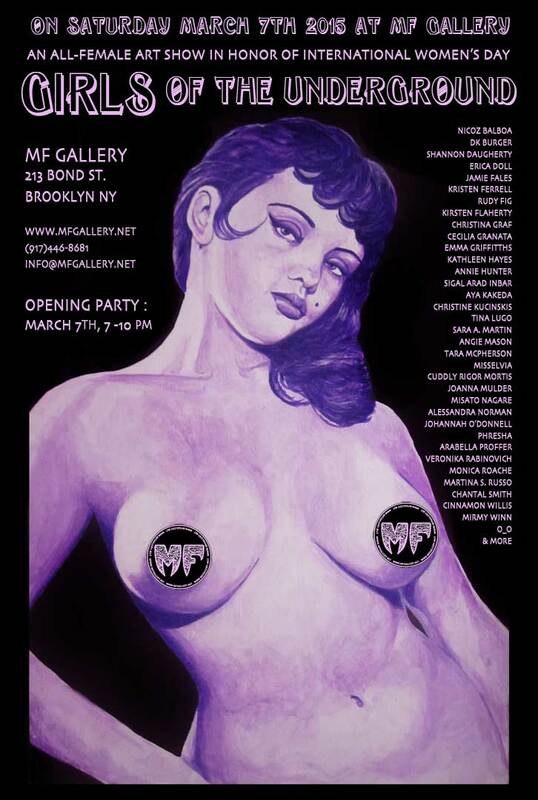 Opening party at MF Gallery, Sat. March 7th, 2015. Artwork by Christine Kucinskis. 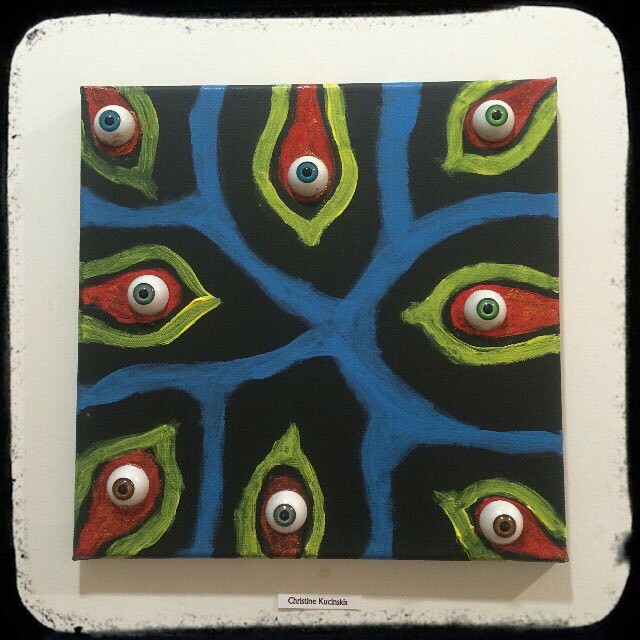 Opening party at MF Gallery, Sat. March 7th, 2015. Art by Joanna Mulder. Opening party at MF Gallery, Sat. March 7th, 2015. Artwork by Nicole Steen. Opening party at MF Gallery, Sat. March 7th, 2015. Crowd at the MF Gallery art opening for “GIRLS of The Underground.” Sat. March 7th, 2015. In closing, I’d like to thank both Big Apple Comic Con and MF Gallery for having me be a part of the successful events. Getting ready for tomorrow. During the day I’ll be at the Big Apple Comic Con, selling my comics. When night falls, I’ll be at MF Gallery. There’s a group artshow titled ‘Girls of The Underground.’ I’m one of the artists taking part of this exhibit. You can see a preview of the show here. In the meantime, I’ll leave you with this. 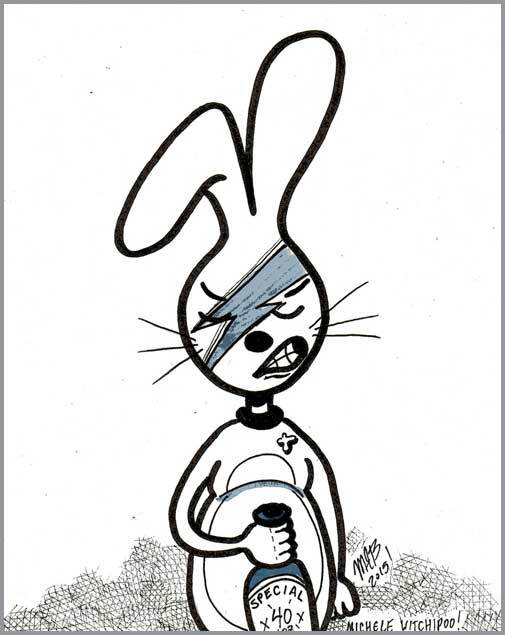 My comicbook character Psycho Bunny as Ziggy Stardust. Bowie might not be amused. Psycho Bunny as Ziggy Stardust. Psycho Bunny is a comicbook character created by Michele Witchipoo. March 2015. Did a Steampunk-ish version of the Pink Panther. The sketch itself took about 20 – 30 minutes. Usually I don’t like to rush, but it had been a while since sending something to Sketch Lottery. The art was done in ink and watercolor.